When the website reached out to the Chevrolet car and crossover team regarding an official comment on NAIAS, they were told that “there’s nothing planned”. This is the first official response we’ve seen and it falls in line with some of the rumors we’ve alluded to recently as reported from the MidEngineCorvetteForum.com and vloggers like Rick Conti. One reason to believe that Chevrolet is skipping NAIAS is the General’s “radio silence” on the C8. It’s highly likely that Chevrolet will telegraph the launch location with the start of a promotional campaign for the new generation. Leading up to the C7s launch, the Corvette team previewed the new C7 crossed-flags logo two months before the reveal, showed the new LT1 engine to the press, and offered four preview videos on youtube as part of the launch countdown. If Chevrolet does again what went so well with the C7 reveal, it should mean the C8’s launch won’t be far off. 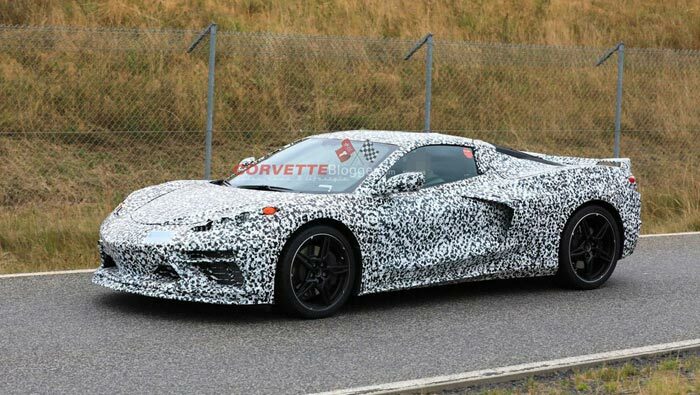 More and more we are hearing about the 2020 Corvette launching at the New York Auto Show in mid-April. Corvette enthusiasts know that the first Corvette debuted in 1953 in NYC, and it’s also the location where future chief engineer Zora Arkus-Duntov would see the car for the first time. There’s a lot of history right there and we can see the launch team linking the Corvette of the future to a seminal event in Corvette’s storied past. We also like NYC because then the C8s will most likely be onsite at the NCM Bash at the end of April. The C8 generation’s streetcar launch isn’t tethered to the launch of the Corvette racer like the 2015 Z06 and C6.R that were launched together at the 2014 NAIAS. That does provide the Corvette team the freedom to select the time and date of their choosing. Other reveal locations suggested include an IMSA race (Daytona or Sebring), Chicago Auto Show, Geneva Motor Show, and even the Indy 500 (because Fernando Alonso!). We have no doubt that the Corvette PR team locked in the C8’s reveal location some time ago. Having a later launch date will shorten the [crazy] time between when the car was revealed and when it goes on sale, assuming that production starts sometime over the summer of 2019. For the C7 Stingray, that time was roughly nine months and we understand that reducing that time span to keep potential buyer’s interest high in the car may be part of the launch strategy. As long as the launch is not in Dubai……that was pathetic. It should clearly be done in Detroit….. the soul of the AMERICAN car . I thought GM was done with the contrived notion of NYC somehow being the epicenter of American car culture and design, when they fired de Nysschen and got Cadillac the hell out of there. And now they’re doing again with the C8? Really!? No one in NYC even owns a car. If they don’t do it in Detroit, or at least at Bowling Green, they’re out of their minds. I guess I won’t be going to Detroit in January. I guess I will not be going to Detroit in January. Versions that will come later. Just things like MPG,weight, Engine output and performance data at least for the standard version. “NOT in NYC sewer”?? Has anyone taken a look at Detroit lately? Okay they have an electrical problem, So they could send a shinny red proto type or mule to the Detroit Show. I am sick and tired of all that G D camo crap just show us the G N car!